When he's wasn't turning into a 200-foot-high monster and saving the cartoon town of South Park from Barbara Streisand, Robert Smith has spent the last two years preparing himself and the rest of The Cure for the launch of what will surely become a milestone album. Initially pencilled in as a Spring 1999 release, Bloodflowers has been ready and waiting for the past six months, but we have had to wait until the end of the Y2K frenzy for their latest offering to hit the shops. Written on the back of a host of cracking festival gigs and recorded at several studios in the south of England, Bloodflowers is well worth the wait, taking full advantage of hi-tech equipment and creating a nine-track album that must rank as one of their strongest. Smith's vocals aren't the strongest that the music industry has ever come across, but musically this album is a gem that has plenty of opportunity to shine in this collection of new songs that reach as long as 11 minutes in length. "Out Of This World" is a stormingly mellow opener, moodily examining the depressing structure of real lives, while the mammoth "Watching Me Fall" follows on and makes you realise that "Bloodflowers" is indeed something special. 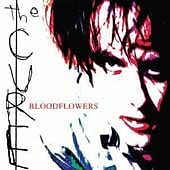 Putting the title track and "39" aside, this is a tight new release from The Cure and while it's difficult to see where any hit singles are going to come from, the album is a credit to their realism and creativity.